This past weekend I made orange macarons for this months crafternoon. (I think they kinda look like breakfast sandwiches) I had this huge plan to make peach, lemon, orange and raspberry macarons, but I got a bit sidetracked with my quilt and only ended up making the orange. The shells are flavored with orange extract, and the filling is just plain ole butter cream with orange juice instead of vanilla extract. They tasted awesome! I may make some kind of chocolate filling the next time. Any suggestions for the next flavor I should try? 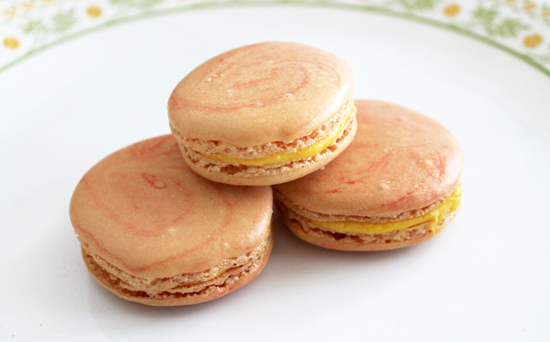 This entry was posted in Baking and tagged macaron, macarons, orange by jesseesuem. Bookmark the permalink. I have a suggestion. I suggest you mail me some of those. Thank you. Good day. Once I figure out how to mail them, I will totally mail you some!!! I have GOT to try making these. I’ve never had one and I don’t know of any places around here that sell them. Your pictures always make me drool!